As a vacation rental host, you know there are tons of tools out there to help you harness the power of the internet and make your rental venture a success. From smartphone apps to full-blown desktop management systems, the industry has you covered. As a new host, you likely gravitated to listing sites like Airbnb, VBRO, FlipKey, and other comparable platforms to show off your place and get the rental ball rolling. But now that you’ve hosted a few (or a lot!) of guests, maybe you’re wondering if there’s something more you could be doing to set yourself apart from the masses of homes out there. There is: Creating your own vacation rental website. It can seem intimidating at first, but we’re here to tell you it doesn’t have to be. Whether you decide to build a site through a specialized platform or simply create a self-hosted site using a WordPress theme, you’re still taking one extra step to separate yourself from the competition. 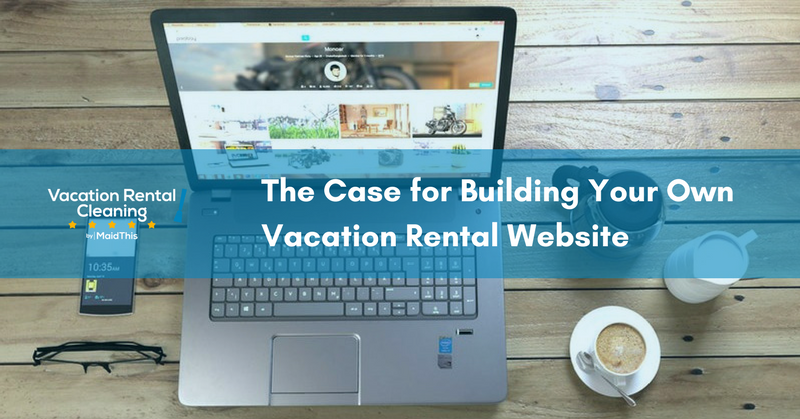 Here are 5 reasons why you should consider building your own vacation rental website. 1. Make more money by forking over less of your earnings to listing sites. Airbnb (and other comparable vacation rental listing sites) take a cut of every reservation made through their site. This isn’t surprising or even bothersome – like you, they’re running a business and have to make money somewhere. However, at Airbnb, that amounts to 3-5% of the rental total from your guests. For shorter stays, that won’t hurt much. But when you manage to land a long-term guest staying for several weeks, suddenly that 3% fee feels a little more painful. When you take into account your weekly or monthly discount to entice longer-staying guests, it really cuts into your profit margin. 2. Personalize your vacation rental website and better introduce yourself to your guests. Most vacation rental listing platforms have a space for reviews left from previous guests for potential renters to see and better gauge how you’ll be as a host. Such reviews are important for the overall look of your entire listing and how you’re perceived. But what if you had complete control over what the reviews said? What if you could curate reviews specifically from your favorite guests? With your own listing site, you can. You set the tone, decide what stays and what goes, and where and how you want to display your praise. In addition, you have more opportunity to personalize the overall feel of your vacation rental website and introduce yourself on a more personal level. This can be especially great if you like to be very hands-on with your guests’ bookings, arrivals, and departures. 3. Showcase your vacation rental in more detail than what is available to you on listing sites. We all know the importance of posting excellent photos of your space and why it pays to hire a professional. But even though you have control of which images you share on major listing platforms, you have no control of how they’re shown. The platform will showcase every listing in the same way for clarity and while that’s great for the guests sifting through the countless listings that may match their rental criteria, it doesn’t do much for you. By setting up your own site, you have total creative control. You can make a slideshow, a special gallery, or simply pepper your pictures throughout your site. Show your guests what you’ve got! 4. Get discovered by guests who want to forego the overwhelming options. Google is still the friend of every internet surfer. If someone is really curious and not interested in sorting through dozens of vacation rental listings, they’ll be more likely to find just what they’re looking for by using a regular search engine. To beef up your searchability even more, start a blog and keep it consistent. The more SEO-friendly your website is, the more Google and other search engines will like it. 5. Position yourself as more of an industry insider. Think about all the vacation rentals listed on the major platforms: There are literally thousands. Now think about how many of those thousands have their own individual and unique websites showcasing their awesomeness. There aren’t nearly as many. Want to stand out from the crowd? Set up your own website. Even if you’re only doing it for a single vacation rental, you’re still separating yourself from the herd and giving the impression that you’ve been in the business for a while, know trends in the industry, and know how to care passionately for your guests. If you’re not using services like Airbnb, FlipKey, or others, you have an opportunity to save money or at the very least, funnel it into another part of your business. In our math problem, “x” represents the rental amount you’d be securing from your guest through a platform like Airbnb. The “0.03” is that 3% cut that Airbnb takes. The “$___” represents the monthly cost charged by the hosting provider to use their platform to create your own website. Ultimately, it’s down to you to decide if it’s worth the cost. While Lodgify will run you at $36 each month (not including discounts for up-front annual payments), Rentivo currently runs at $50 per listing. These are definitely not the only options out there and with the way things are going, they won’t be the last. But once you’ve done the math, you may decide to stick with the likes of VBRO and its competitors. If you’re ready to make a change and continue to build your business, creating a unique vacation rental website is a great way to make a next step. It’s certainly not the only option available to you, but it’s an excellent way to stand out. Need a turnover cleaning service for your space? Check out what MaidThis! handles for our vacation rental clients.